Following on from the first 2 stages of my poppy sculpture, it was time for the most difficult part, making the fully open poppy flower head. You wouldn’t believe how many different types of poppy exist. I needed to set on a style, so I decided to go for the classic 4 petal design. I added furred edges to bring in my own design style and because I thought they needed a softer edge than the straight steel provided. Work began with some real poppies, taking them apart, flattening out the petals and then making paper templates. I then used these to mark out the shapes of the 4 petals (which are actually different sizes) and then again my trusty new plasma cutter came into its own. Shaping the petals into a natural look was quite difficult. Poppy petals are very thin and don’t hold their shape well, so a natural look is actually folded back and loose looking. I also hammered folds into the petals radiating outwards to give that paper look. 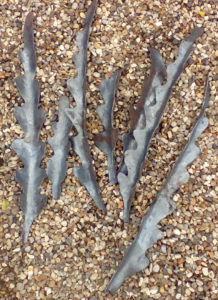 Finally I added centres, again cut out with my plasma cutter and ridged to show the beginnings of the seed pod to come. Stems were added and the poppies finished. For some reason I don’t seem to have taken any pictures of the process, only of the finished flower head, which is below. I made 2 to balance the sculpture. 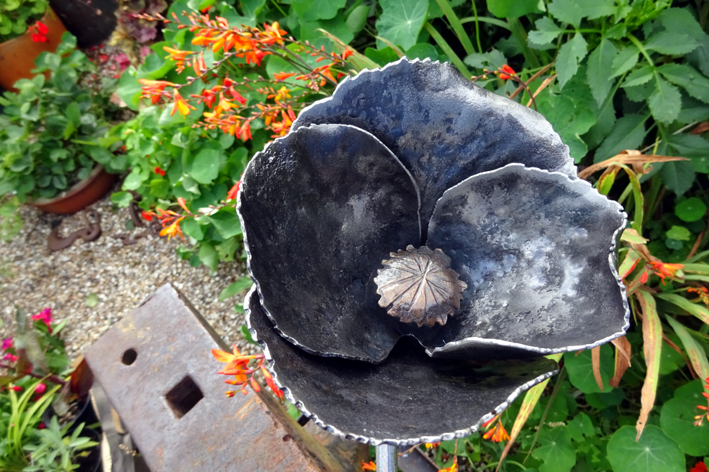 Following on from stage 1 of my poppy sculpture project, the second stage of making the poppy sculpture was making the most important part, the poppy flowers. I started by taking lots and lots of photographs through the summer months. The first thing that became very obvious was the amazing range of poppies to chose from. In the end I took a slightly artistic view of the classic 4 petal red poppy. I then decided to show the flowers in 3 key stages, the developing bud, the fully open flower and finally the classic seed head. Dealing with these in order, we of course start with the bud. 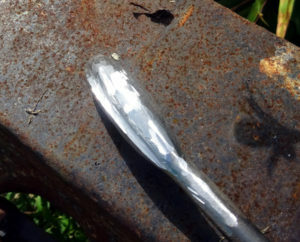 This was made by first welding a piece of bar onto a smaller bar, the bud and the stem. 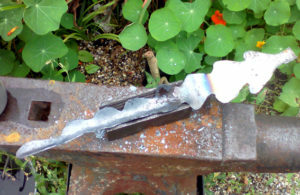 Next I forged the shape of the bud, including a fold in the side to represent the unwrapping bud. 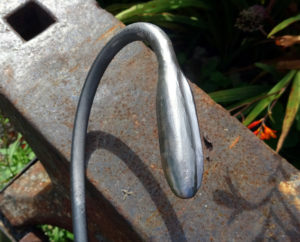 Finally the stem was hammered and rounded to make it look less like a piece of bent rod. 3 of these were needed, at differing heights, for the final sculpture. 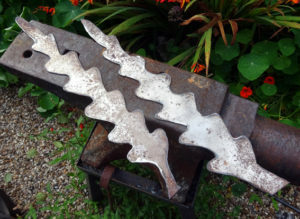 I have been delaying revisiting my blacksmith poppies and the ‘how I made them’ bit. But here goes. First of all a reminder on the left of how it all finished up. The rock was made from a piece we obtained from our favourite farm in Northumberland. That was the easy bit, simply drilling some holes ready for the metal stems. Except it wasn’t that easy, think flower arranging with very heavy flowers and you get the idea. On to the first element, the leaves. First stage was to cut them out of 1.5mm sheet steel using my nice new plasma cutter. As ever, the right tool for the job made it very easy to do, but without it, it would have been impossible. The next stage was to form the sheet into leaf shapes. 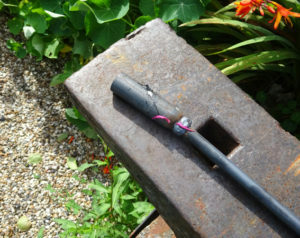 This required the forge and a heavy gauge V block. more 3 dimensional and leaf like. Repeated another 6 times and I had the 7 leaves I needed. As with gardening, even numbers just doesn’t look right. There is probably a mathematical rule for it somewhere, but simply put, 7, not 6 and not 8, leaves were now ready for the next stage. Come back soon for stage 2. 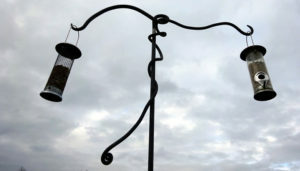 The cold of winter, and general lack of food for our feathered friends, makes it a great time to put up a blacksmith bird feeder. I have made 2 on a similar theme, basically because a lady asked me to make one against a sketch and then my wife liked it so much she wanted one too. 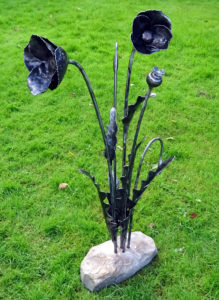 They are free standing, with a spike to push into the ground, 7 foot tall and made from 19mm steel. This makes them very substantial, able to stand up to the biggest birds and strongest winds, and to my general style of nothing thin and flimsy. They were left in untreated steel finish, so will rust and age gracefully. I just wanted to wish everyone a very Merry Christmas and a Happy New Year. 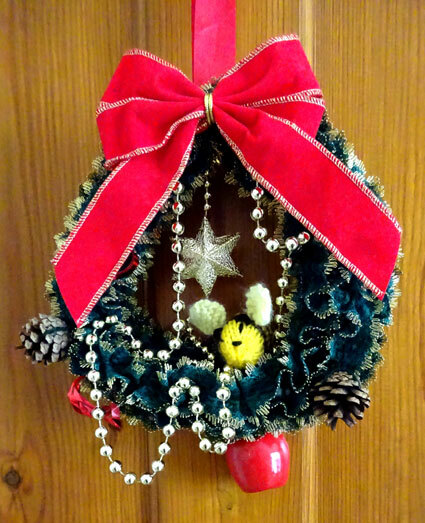 Continuing our love of making use of treasured things rather than buying new, this is a knitted wreath made by my Grandmother over 20 years ago. It comes out every year and has pride of place in our home.